A person's step length and rate may be measured, for example, through sensors that collect spatial and temporal gait parameter data. 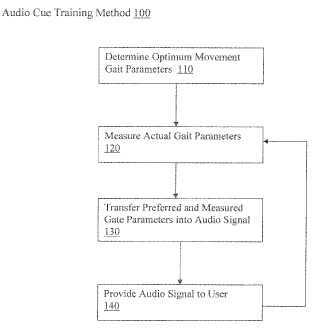 The measurements are then used to determine the rate of a rhythmic auditory cue to improve the person's gait. For example, a system links sensors to detect step rate and length to an audio cue provided to headphones, while providing the appropriate algorithms to accomplish real time adjustments to the audio cues as needed to better help change the person's step length vs. step rate ratio in a desired direction depending on therapeutic or performance goals.